As we settle into the frost and sleet, it’s often peppermint lattes and salted caramel hot chocolates that steal all of the wintertime beverage excitement. This year when it comes to sipping on warm drinks, we are inspired by British culture and their love for a cup of tea. Rest assured, you don’t have to travel to London, England to experience the elegance of an afternoon tea ritual. Canada has a number of exquisite tea rooms that are guaranteed to make you feel like royalty through their authentic British vibes. From elaborate hotels in Toronto to traditional lounges in Vancouver, here are a few tea rooms to help you warm up in style this winter. Founded in 1927, the tea room at the Windsor Arms hotel is synonymous with elegance and afternoon indulgence. Pair your tea with their assortment of dainty sandwiches and sugary pastries to feel like a true Brit. Aside from gourmet food, in collaboration with the Look Good Feel Better women’s cancer program, the Windsor Arms hotel is also known for its $5 rental of “fancy hats.” Prepare to drink in style as you accessorize your outfit with vibrant, over-the-top headwear. With over 75 premium teas to choose from, the Lobby Lounge at the Shangri-La Hotel is the perfect place to relax on a cold afternoon. Accompanied by live music and artistic showings, namely paintings and sculptures, this Toronto hotel aims to gives tea a modern twist. Tucked inside the luxurious Wedgewood hotel, this tea room is known for its lush velvet banquettes, candles and fresh-cut flowers. Giving off romantic vibes, this lounge offers a selection of loose-leaf teas, herbal infusions and chocolate éclairs, to satisfy your sweet tooth and your thirst for a warm drink. Following England’s beloved tradition since 1908, the Empress hotel is one of the oldest afternoon tea spots in the country. It claims to serve signature scones, clotted creams and strawberry preserves, which contain fresh lavender from its rooftop herb garden and complement the hotel’s 21 loose-leaf teas. Most recognized for its original Empress blend, this exclusive collection of seasonal teas contains components from China, Kenya and South India. Located in the heart of the Plateau Mont-Royal, Le Parloir is a charming yet intimate tea room destination. Inspired by European décor and embellished with Victorian china, Le Parloir creates a vintage ambiance full of character. 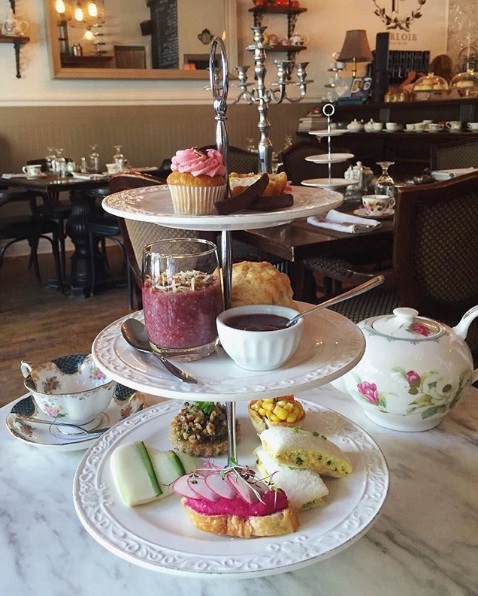 Their signature Plateau Heure du thé platter is served after 2:00 P.M., and is essentially a three tier tower which is garnished with five savouries (sandwiches), five sweets (scones, macaroons, tiramisu) and a large pot of tea. On top of its traditional menu, Le Parloir offers a vegan alternative for the more health-conscious tea lovers and a 100% vegan Heure du Thé platter.